Here's the result, not a bad race that, could have done with a little more action up at the front, but at least it wasn't like Hungary. Also, loved Alonso's response to that radio message. 20th: 40 Pascal Wehrlein: SSA Juniors Mugen - STOP THE CAR NOW AND TURN OFF!!! Very well done to Seb on claiming the podium finish. Unfortunately Nasr was taken out quite early on. On that note, it is becoming very apparent that the main reason we have lost out this season is because we hedged all our bets on Vettel and while he's had a solid enough season his points alone have not been enough to overcome the fact that both SSA and Midori are scoring points regularly with both drivers. Even then, Vettel's reliability has been questionable on occasions. Jenson did well to recover to get a point today, could have been a few more had he had a better start but that's racing. Credit to Alonso for that radio message reply, certainly knows how to make the most out of poor situations! Hello everyone but Daniil Kvyat. We are MIDORI. That went about as well as we could have hoped, really. We don't have the best power unit on the grid, even if we have amazing aero. I expect we'll be a lot more scary in Singapore. Also thanks Fernando, I'm sure our investors in Japan are laughing real hard too. It may not be the most exciting race of the year, but i must confess, i love the Singapore GP! The setting is one of the best in F1, and racing under the lights is just such an amazing spectacle (Bahrain and Abu Dhabi may do the same now, but neither have the same atmosphere). Still, it's been said that this is also an event where someone other than Hamilton or Rosberg might actually stand a chance of winning. To be honest, i'm a little sceptical of that, but i guess we'll just have to wait and see. Anyhow, C4's coverage is extended highlights which means that both quali and the result will not be posted until quite a while after they take place. Good luck once more to all our teams. we're going to be quick here. 21st: 20 Nico Hulkenberg: SSA Aston Martin - mirror, signal, Sainz! Fantastic performance by Seb to finish 5th after starting from the back of the grid. Engine problems left us with a really poor qualifying and we didn't think we'd get anything out of this weekend, so we're really pleased with 5th place for Seb given that. Unlucky to Nasr for not making it into the points too. Seems weird having the Malaysian race at this time of year, it's been a very long time since this race was held towards the end of an F1 season. Still, with any luck, there'll still be thunderstorms which will spice things up a bit (like that time when Kimi was spotted with an ice cream). Trouble is, even if it's just a bit of drizzle they make the race start behind the safety car which is just downright lame if you ask me. Anyhow, i won't see the race itself as i'm out that day (i could really do with one of those TV recorder boxes), so i'll only get to see quali. Good luck to all our teams anyways. Well i didn't see that one coming, when i left the house this morning, Hamilton was firmly in control. 22nd: 5 Sebastian Vettel: A-Grade Honda - messed up at turn 1. Pleased with today's result. After a bit of a lull, we've come back strongly. Both cars with a strong haul of points, in spite of some misfortune at T1 basically costing us the race. Next week, of course, is our maiden home grand prix. So we thought we'd do something neat. Last edited by ミドリ on Mon Oct 03, 2016 12:37 am, edited 1 time in total. Very nice, i've added your new design to the line up on page 1. 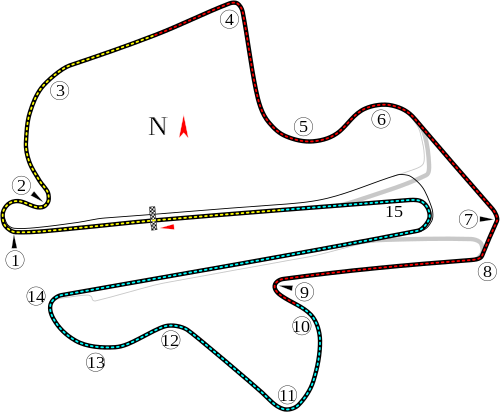 The F1 circus continues it's journey across the far east this week with the Japanese GP. Suzuka has played host to many of F1's most iconic moments over the years, but has in recent times been tainted by the tragic event in 2014 which claimed the life of Jules Bianchi. After the Malaysian GP, DFR and Nico Rosberg will be looking to extend their advantage following Hamilton's Rawr Mugen going pop, but it's widely expected that things will be a lot closer this time around. However, with Daniel Ricciardo winning last time out, their fight may not just be with each other. Unfortunately, C4 only have extended highlights this weekend, so the results here will be delayed. Good luck anyhow to all our teams. Well that was a dull one, kinda glad i only saw the highlights. Good result for our home GP. We can still come third this season, r-r-right guys?